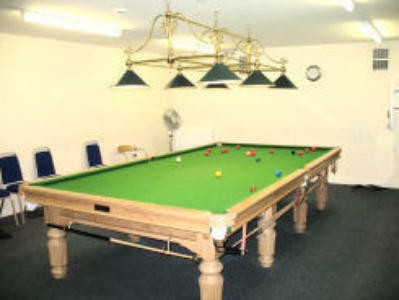 You can just practice, play with another player or in a team, the Snooker Room is open every day for our members. We have a full size snooker table, with over head lights that is kept to a high standard we also have cues available if you wish to use them. The fee is £2.00 for half a day ie 9:00 to 12:00 The snooker room is at the end of the building and is quiet so you can concentrate. We now give beginer lessons and encouraging the ladies to join us. Please ask any player for details.